Michael B standing in front of his mural in Wynwood, Miami, FL. Taglialatella Galleries is excited to introduce the artwork of Mikael B., now on display at the flagship location in New York, NY. 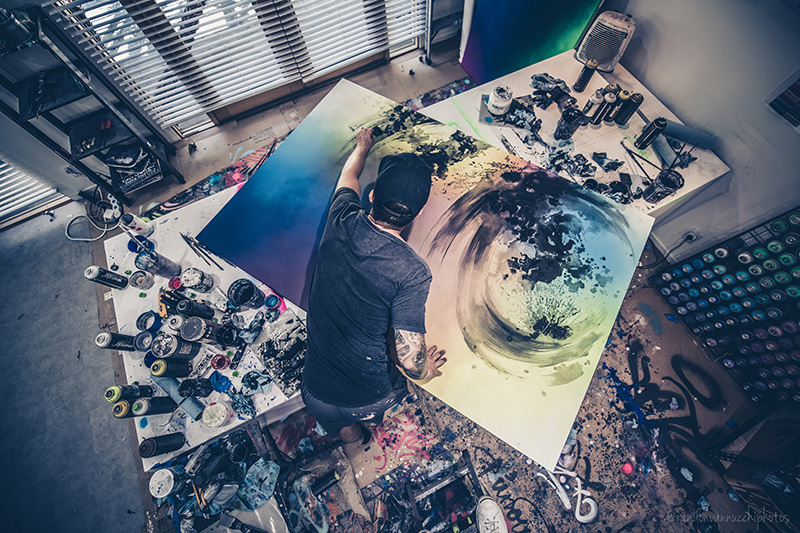 Danish born, Los Angeles based artist Mikael Brandrup’s bold colors and geometric abstract shapes, which have become synonymous with his artistic identity, derive from his early years as a graffiti artist where he was heavily impacted by the “wild-style” genre within the broader medium—a complex, intricate visual amalgamation of forms, words and letters. Bursting with complimentary colors and light, the dynamic universe found within Mikael B.’s work is akin to a visualization of high energy, electronic music. In this world, explosive colors and graphic forms can be combined in infinite variations—he perpetuates the idea in his art, as well as in his personal life, that anything is possible. 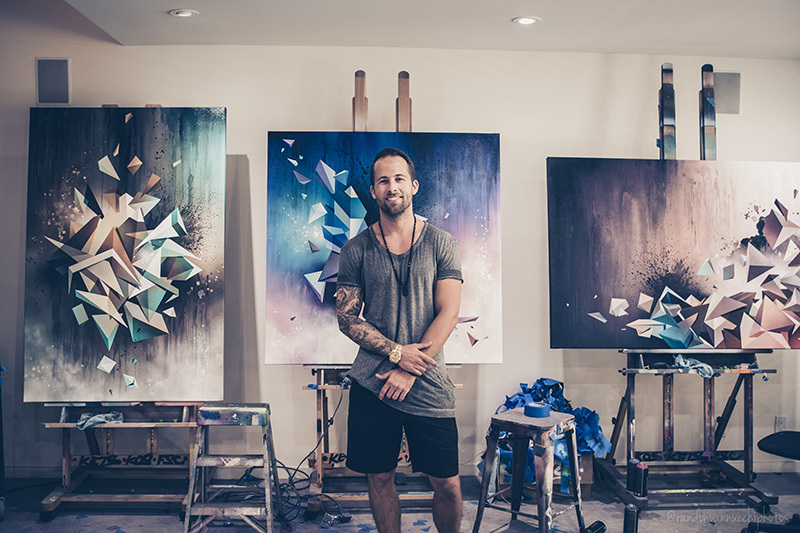 Since moving to Los Angeles in 2013 to pursue his career in contemporary art, Mikael’s dreams have become a reality—boasting a resume with sold out exhibitions, murals around the world, and on-site installations including the SLS Hotel in Miami and most recently The W Hotel in Beverly Hills, CA. Mikael has been commissioned to collaborate with global brands and clients including Google, LinkedIn, Nike and American Express. Mikael B.’s work and exhibitions have been covered by LA Times, Juxtapoz, Graffiti Art Magazine, Artsy, Hi-Fructose and others. To learn more about Mikael B., please email info@djtfa.com or visit the official website of Taglialatella Galleries. See below for a selection of works on canvas, paper and sculpture currently on display at Taglialatella in New York. An ongoing series of Q&As with contemporary Los Angeles-based artists. 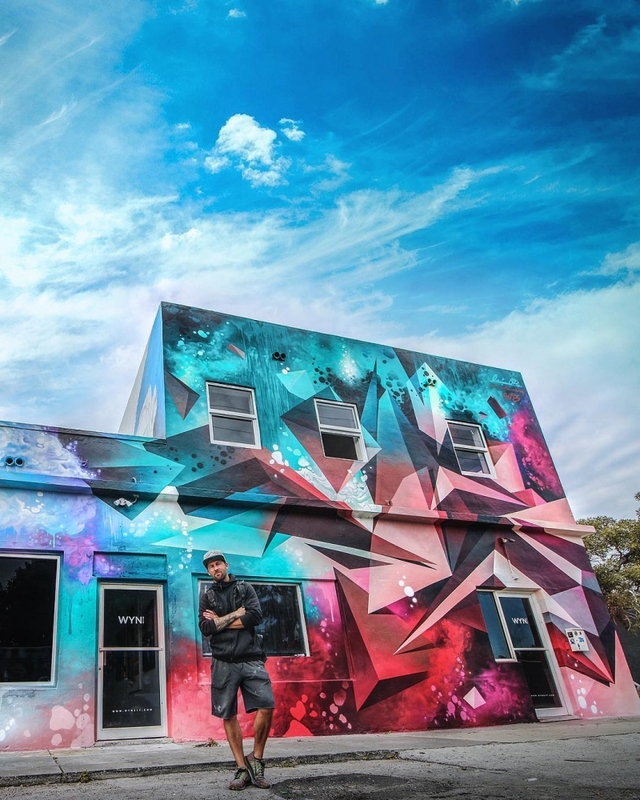 This week we interview Mikael B., a native of Denmark whose love for Wild Style graffiti and the energetic flow of cosmic cubist abstraction combines not only on his murals and canvases but in a pursuit of the American Dream that prompted his move to Los Angeles several years ago. His next show is in New York but you can catch him now on L.A. walls from West Hollywood to DTLA, and in the pages of his gorgeous new monograph, Never Tomorrow. MIKAEL B.: I’ve always felt like an artist. I remember I was the only kid staying in the classroom at recess, I was drawing and creating. Filling my notebooks with abstract and figurative sketches. My notebooks soon became tattoo books because some of my classmates asked me to draw (with a pen) my sketches on their arms and legs. Soon the whole class and other classes around the school would line up for my tattoo designs. I’ve kinda been the outsider but it somehow felt right and I’ve always had the urge to express myself. I create an infinite universe where everything is possible. I would be motivating and inspiring people to follow their passion and dreams. I skipped school and escaped the safe environment around when I started my first company when I was 22 years old. I never fit in in school and educational programs. I’ve always been doing my own thing. Learning by doing and getting shaped by reality. I love learning and experimenting but I've never been a fan of the school system. L.A. had everything I was looking for, an inspirational art scene where only the best survive, which I find very motivating. L.A. has the beaches, the pulsating nightlife of the city, the weather, and people are so positive and welcoming. L.A. makes me think: Everything is possible. So It was a huge dream for me to move to L.A. and follow my passion as an artist. I’m living my dream now. My first show was in Denmark in 2013 where I had my first breakthrough with my abstract world-map series that went viral on social media, reaching more than 1 million people. My most recent solo show was this past October. It was also my most comprehensive show ever, as I took over the 11,000-square-foot space at the Plant in Copenhagen, with more than 40 pieces on view, including my new sculpture series and a Ferrari California with my artwork. At the in-show gift shop, I launched my first merch/apparel line. Right now I’m working on a new body of work for my first show in New York together with Taglialatella Galleries. I'm very excited to show these new paintings that are combining art-historical references from the baroque to cubism with a futuristic fascination. I listen to music nonstop. My studio is always on party mode! Music is a vital part of my mindful studio practice, and I usually disappear into my paintings for hours not aware what's going on around me. It’s mostly deep house but I also enjoy trance, dance, jazz, pop/rock. The Danish-born, LA-based artist has had a wild career in a relatively short time, showing at many galleries including the eponymous gallery of our late and greatly missed co-founder Gregorio Escalante, who first introduced us to Mikael's work last year. In anticipation of his upcoming show, we caught up with Mikael about his latest show and some of his incredibly ambitious projects. Read on below. Eben Benson: When did you start this latest body of work? Was it made specifically with Copenhagen in mind? Mikael B: I already knew that I wanted to come back to my home country and do a solo show over a year ago. At that time I was in the early stages of the concept development and rough ideas. I played around with it all in my mind for months before I actually started to execute on the new experiments that would be a part of the show. Working on my pieces I didn’t actually think that it was for Copenhagen, I guess I just disappeared into the canvases. Now that I’m done with all the pieces I almost feel that I have been in a dream preparing for all this for such a long time. An amazing dream with all kinds of feelings involved, good and bad, ups and downs. What's one of the big differences you notice about showing in Denmark over the US? I'm probably the only artist in Denmark to do a complete take over of such a huge location (+10,000 sq. ft.) with no gallery involved. In the US you see more of those huge shows like Shepard Fairey, Banksy and enormous curated group shows like Beyond the Streets. Which has all been a huge inspiration. In Denmark, my team and I have always been doing our own thing and selling directly to collectors. In the US we are doing both - doing our own shows and showing with galleries as well. Coming back where I grew up is also a special feeling. And people from all over the country of Denmark have been urging me to come back and do a show. Even though I live on the other side of the world I feel a huge support from Denmark for all the stuff that I do in the US. Denmark is where it all started for me and the people here have been following me since I started till where I am now, so I feel close to all my followers, fans and collectors in a different way. I’m still new to the US, moved over here 4 years ago, so we are just getting started. Tell us a bit about the Ferrari you painted for charity. How did that come about? What was your goal with that piece? A collector of mine happens to own the number one car-wrapping company in Denmark so he reached out to me and the Cool Car Race founder Jacob Risgaard and asked if we wanted to join forces. CoolCar Race is like the Scandinavian version of Gumball and it's all for charity and all proceeds benefiting vulnerable and affected children. It was a no-brainer for me to do this. I painted the original canvas piece "Firestorm" that was used as the reference for the wrapping of the entire Ferrari California. I wanted to compliment the shapes and the look of the Ferrari with my art but also create a contrast and make it something very special that you haven't seen before. Even more important I wanted to draw attention to this amazing project and raise even more funds than last year. So it was very satisfying that we raised over $250,000 for that project being $100,000 more than the year before. What's a color that you've been using now more than you did before? What direction do you see your work going in as of now? I change it up all the time and this body of work for my show will show you a lot of experiments and studies that have been on the way for a long time. The most noteworthy is probably gold and monochrome schemes. I've always experimented with multi-color pieces but lately, I’ve been working in the depth with fewer colors. My new sculpture project is also a good example of that. But I love colors, and it origins from my graffiti which I have been doing since I was 16 years old. And of course, you will see some crazy multi-color pieces and even fluorescent pieces. I'm creating more of a universe. I'm not only doing canvas pieces, I'm also experimenting on cardboard, metal and new sculptures, as well as photography/photo manipulation in combination with acrylic and spray paint. Has the work for this latest show been made with any particular mantra in mind? I’ve been living in LA for the last 4 years but my crazy adventure started in Denmark. With “Never Tomorrow”, I return grateful and with the message to consent to life and seize opportunity every day. The Dalai Lama tells us there are only two days in the year that nothing can be done. One day is yesterday and the other is tomorrow. In return, we are left with all of the undreamt possibilities. I praise courage, willpower, and focus. I fight rules, traditions and all those who tell us what we ought to do. Realize your wildest dreams by making decisions that will bring those dreams to life and you can change yours and others’ lives forever.